The 22nd Annual Equal Access Clinic 5K Race will take place on Saturday, March 16, 2019 at 8:00am at Southwest Recreation Center! The Equal Access Clinic Network is a network of student-run free healthcare clinics established by the University Of Florida College Of Medicine in Gainesville, Florida. Our clinics are made possible through the generous contributions of our student and faculty volunteers as well as funding from the community. Race Distance: 5K Race Route known as "The Boot"
Entry Fee: Registration will be $20 for children and $25 for adults for pre-entry until Fri, March 15, 2019 at 9am! Race day entry on Sat March 16, 2019 will be $25 for children and $30 for adults! Make checks payable to University of Florida Foundation, Inc. No refunds will be available. Registration: Register online at www.itsyourrace.com. An additional processing fee will be charged by itsyourrace.com for online registration. Online registration closes on Fri March 15, 2019 at 9am. Course: The start/finish area is located across the street from the Southwest Recreation Center in the parking lot of the Phillips Center for Performing Arts on the University of Florida’s campus at Hull Road and SW 34th Street. The course is entirely on UF campus and goes down Mowry Road, Gale Lemerand Drive, past Fraternity Row, and Lake Alice in a loop to end at the start/finish area. Amenities: The first 100 runners to arrive on race day will also receive a free EACN 5K Race T-Shirt! Timing: The EACN 5K will be timed and scored by Jaguar Timing Systems electronic bib tag services! Your entry fee covers the cost of the disposable chip which does not need to be returned. Bib MUST be worn on the front chest to be scored electronically. Please do not fold the microprocessor. Packet Pick Up: NO RE RACE PACKET PICKUP - Pick up at Registration Table on Race Day. PLEASE arrive early to avoid long lines AND GET A SHIRT. Awards: The overall first place male and female will receive a trophy, awards, and other prizes! In addition, there will be a silent auction, free food and snacks, raffle prize giveaways, and tons of door prizes available to all participants! Results: Results will be posted near the finish line within minutes of the conclusion of the race and on the internet at www.milestoneraceauthority.com. 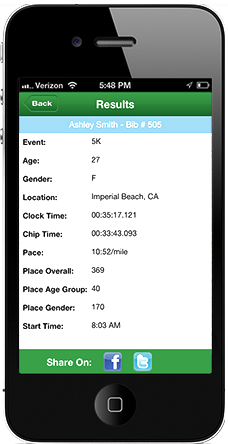 Include your cell phone carrier and receive INSTANT SMS text message of your race time.